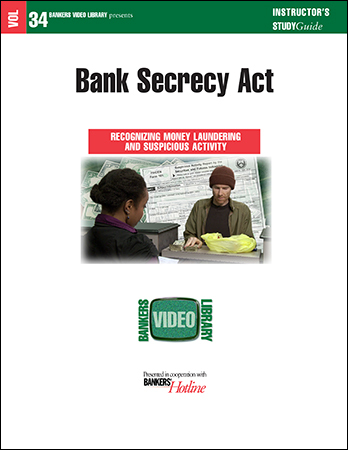 It has become more critical than ever to provide Bank Secrecy Act, Anti-Money Laundering training for your front line. Regulators and examiners are checking much more thoroughly and fines for non-compliance are becoming much more common. This video training program, used with the accompanying material, will provide you with evidence that you are in compliance with government mandates. We've made it as easy to understand as possible so there can be no question of what money laundering is and what your front line must do to combat it in order to keep your financial institution in compliance with both the law and the regulation.